This article is about political foundations affiliated to Europarties. For the Europarties themselves, see political party at European level. A European political foundation, formally a political foundation at European level, informally a Eurofoundation, is a research and advocacy organization close to, but independent from a Europarty. They are funded by the European Parliament. Their purpose is to act as platforms aiming at developing forward-looking ideas and concepts for their respective political family and providing a forum where those ideas can be widely debated. 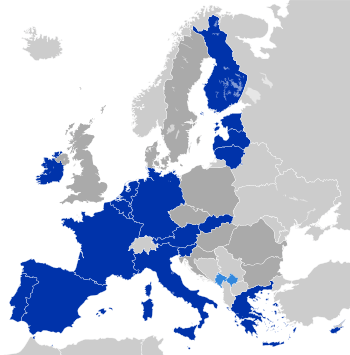 There are nine Eurofoundations as of 16 March 2009. Regulation (EC) No 2004/2003 of the European Parliament and of the Council of 4 November 2003 defined what a Europarty, or political party at European level, was and tightened up their regulation. That regulation was later heavily amended by Regulation (EC) No 1524/2007 of the European Parliament and of the Council of 18 December 2007. That amendment provided for the earlier-floated concept of a political foundation at European level, a legally separate affiliate to an Europarty created to help them disseminate their principles to a wider audience. An initial €1 million was allocated for pilot proposals, and Call For Proposals DG/EAC/29/2007 went out with a deadline of 28 September 2007. Ten organizations were picked (one for each Europarty) and money was allocated with an expiry date of 31 August 2008. As of 1 November 2008, the regulation governing Eurofoundations is Regulation (EC) No 2004/2003 of the European Parliament and of the Council of 4 November 2003, as later amended under codecision (see above). That regulation's European Commission factsheet is given here. Their total allocated funding for 2008 is €5 million. EUROPA – Osservatorio sulle politiche dell'unione 113 Via del Seminario, Rome 00186, Italy Alliance for Europe of the Nations 48,900  Active Shares an address with Osservatorio Parlamentare, whose website is here and associated foundation is here. Les Refondateurs Européens 34 Rue Pasteur, Lyon 69007, France Alliance of Independent Democrats in Europe 36,000  Defunct Changed its name in April 2008 to Association pour la Fédération Politique Européenne pour la Démocratie, whose website is here and address is Rue de la Cambre, 237, bte 4, Brussels 1150, Belgium. Organisation for European Interstate Cooperation Rue Troné 113-115, Brussels 1050, Belgium EUDemocrats 22,530  Active website in 2011 OEIC replaced Foundation for European Democracy (FEUD) as the affiliated foundation of the EUDemocrats. FEUD was affiliated with EUDemocrats from 2008-2011. It was reported on 1 November 2008 that Declan Ganley had registered a company in Dublin called the Libertas Foundation Ltd and that it was intended "to act as a European Political Foundation for the Libertas Party". Ganley attempted to get EU recognition and funding of €111,000 for the Libertas Foundation in February 2009, but the attempt was rejected because its board members were all from one member state and the foundation name was the same as the aspirant Europarty also founded by Ganley. The same meeting of the Bureau of the European Parliament that rejected the Libertas foundation but (momentarily) recognised the Libertas party also defunded the Alliance of Independent Democrats in Europe (AIDE). The foundation affiliated to the newly created Alliance of European Conservatives and Reformists is New Direction. ↑ "EUR-Lex - 32003R2004 - EN". Retrieved 26 August 2015. ↑ Regulation (EC) No 1524/2007 of the European Parliament and of the Council of 18 December 2007. ↑ "EUROPA". Retrieved 26 August 2015. ↑ "EUR-Lex - 2007_130 - EN - EUR-Lex". Retrieved 26 August 2015. ↑ "Structure". Retrieved 26 August 2015.